How to create a Gantt chart for multiple projects in a portfolio and show which ones are over-budget and under-budget. If you have multiple projects, you need a quick and easy way to see which projects in your portfolio are meeting their financial targets, and which ones are over-budget. 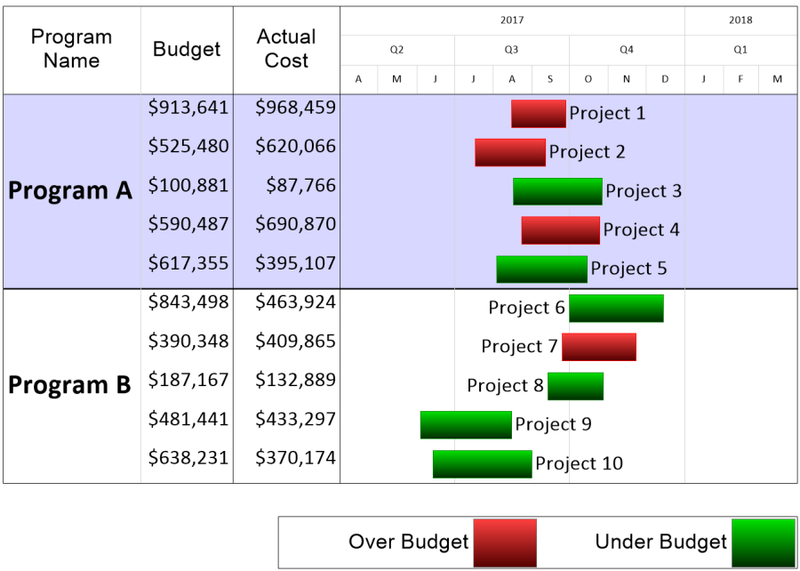 OnePager Express can create a Gantt chart for all of your projects, plus high-level budget information. Launch OnePager Express. Don't have OnePager? You can download a free trial. Give your report a name, click Next, and then Create New Project View to get a first draft of your project portfolio budget report. Once you've built your budget report, it's easy to update each week or each month and your projects and your budgets change. No need to re-build the report from scratch; OnePager can import fresh data from Excel into an existing report, making tracking and updating your portfolio of projects very easy! Get started today by downloading a free trial, complete with our world-class tech support.